Nazra for Feminist Studies is honouredas its Founder and Executive Director Mozn Hassan received the “Right Livelihood” award known as the Alternative Nobel for 2016. Feminist activist and woman human rights defender Mozn Hassan and Nazra received this award for the work they conducted on several issues – including and not limited to – combating sexual violence against women in the public sphere and provision of various support services to survivors of these crimes, supporting women’s right to participate in the political sphere and guaranteeing the inclusion of their rights in the constitution and Egyptian legislation, supporting young feminist initiatives in their work on different issues, and supporting women human rights defenders and shedding light on the violations they encounter and urging the Egyptian state to undertake necessary measures to ensure a real and effective participation of women in the public sphere, and exercise their fundamental right to bodily integrity. 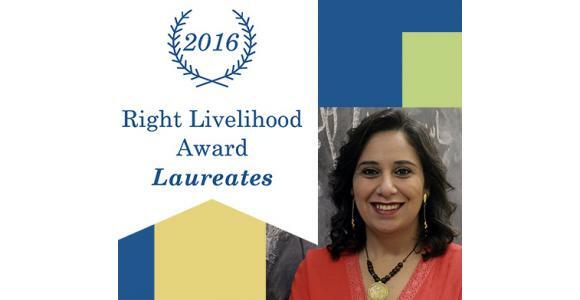 It is worth mentioning that the “Right Livelihood” award known as the Alternative Nobel was founded in 1980 to recognize and support the courageous work of individuals and groups that present unusual and innovative solutions in the face of several important issues that face our world today. Approximately 166 individuals and groups received this award from 68 countries, where in Egypt both Dr. Ibrahim AboElEish – Applied Chemistry Scientist – and Sekem Foundation received it in 2003, and the Architect Hassan Fathy received the founding award in 1980. Nazra for Feminist Studies values this recognition, and asserts its continuation in moving forward to achieve its vision and objectives represented in ensuring a safe public space for women in Egypt, where they exercise all their fundamental rights, and also asserts that what Nazra has accomplished is a continuation and sustainability of what the Egyptian Feminist Movement has accomplished in almost 100 years,in addition to the current role worthy of recognition of our dear partners on the local, regional and international levels. We also note that feminist activist and woman human rights defender Mozn Hassan will not be able to travel and receive this award due to a travel ban that was issued against her by an order from the general prosecutor within the context of her inclusion in Case 173 for 2011 commonly known as the “NGO Foreign Funding Case”.